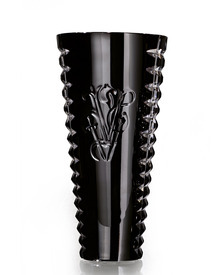 Crystal conical vase engraved with two Visionnaire logos on the sides. Mouth blown crystal, shaped and diamond cut techniques grounded by hand. Made by the procedures of the artisan tradition of 'Made in Italy'. The craftsmenship of each peice makes it a one of a kind. As a result each piece is unique so any irregularities are to be considered special to that indivdual piece.